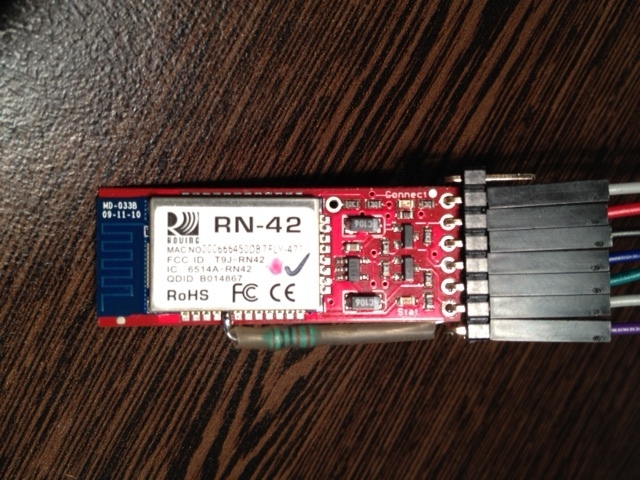 The Roving Networks RN-42 modules are handy pieces of kit, and can be obtained neatly packaged up as the SparkFun BlueSMiRF. The module makes it very easy to interface a microcontroller to Bluetooth using various of the standard human interface profiles: you can make your microcontroller act like a bluetooth keyboard, or a mouse, or a serial port. The BlueSMiRF HID version starts up as an imitation keyboard – it can be paired with a device just like a normal bluetooth keyboard. ASCII characters sent in the serial port are transformed into Bluetooth keyboard events. I’m particularly interested in using this as a way of getting data into uncooperative devices. This technique is used by the iCade for example. The RN-42 runs in two modes: “Command Mode” and “Data Mode”. Upon power up the device will be in data mode. To enter command mode, send the characters “$$$” through the serial port or from the remote Bluetooth connection. The device will respond with “CMD” […] You must enter command mode with in the 60 second configuration window or the module will go into fast data mode where all characters are ignored including the “$$$”. The characters “$$$” could be accidentally sent during the configuration window, unintentionally putting the device into command mode. This is unlikely to happen by chance, but leaves the link vulnerable to an injection attack. You must enter command mode within the first 60 seconds or lose the chance to do so. The way to get around this is to switch to command mode immediately when the device starts up, execute any commands you need to and then switch to “fast data mode”, where the RN-42 will ignore the $$$. If you need to enter command mode again, you have to pull the RESET line low to reset the device. As a bonus, which the RESET line is held low, the RN-42 goes into ultra low power mode, conserving battery power while it is not being used. Unfortunately, the RESET line isn’t brought out to a pin on the BlueSMiRF board. Fortunately, it is relatively easy to add it. The 10K resistor lets you control the 3.3V line from 5V logic, just like the resistors on the BlueSMiRF board for the RX and CTS lines (see schematic). The pin can then be pulled low from a spare I/O pin on the microcontroller, causing the RN-42 to shut down into low power mode and reset when it is brought back up.